Exuding beauty and class, the 49-inch Belle Foret Estates Bathroom Vanity offers classic styling that adds elegance and warmth to larger bathroom spaces. Featuring hand-carved wooden scroll accents and antique bronze hardware, this vanity's polished black granite top is pre-drilled for an 8-inch widespread faucet and includes a white under-counter vitreous china sink basin and a backsplash. Providing ample storage space, this vanity has two centre doors that conceal a deep cabinet and full-extension drawer along with six additional full-extension drawers that flank the cabinet doors. Ideal for pairing with the matching Estates collection mirror, this gorgeous vanity is a simple solution to upgrading your bathroom with style and functionality. Enrich your bathroom ambience with this upscale 48 inch W vanity paired beautifully with the 49 inch Tempest Black marble top. With a classic white finish and a clean, sleek profile, this modern piece has an understated elegance that will impress homeowners and guests alike. Two large cabinet doors with soft-stop bumpers and three left-side drawers open up a bevy of storage options for linens and bath essentials, setting the tone for a tidy powder room. The sturdiness and craftsmanship of this vanity cabinet will make you think it is custom-built, while small details like leg levelers instill confidence for perfectly stable setups. Gaze through the Foremost Ashburn collection for complementary white items like wall cabinets and mirrors for a complete bathroom makeover. Estates 49-inch Vanity in Antique White with Granite Vanity Top in Black Exuding beauty and class, the 49-inch Belle Foret Estates Bathroom Vanity offers classic styling that adds elegance and warmth to larger bathroom spaces. Featuring hand-carved wooden scroll accents and antique bronze hardware, this vanity's polished black granite top is pre-drilled for an 8-inch widespread faucet and includes a white under-counter vitreous china sink basin and a backsplash. Providing ample storage space, this vanity has two centre doors that conceal a deep cabinet and full-extension drawer along with six additional full-extension drawers that flank the cabinet doors. Ideal for pairing with the matching Estates collection mirror, this gorgeous vanity is a simple solution to upgrading your bathroom with style and functionality. 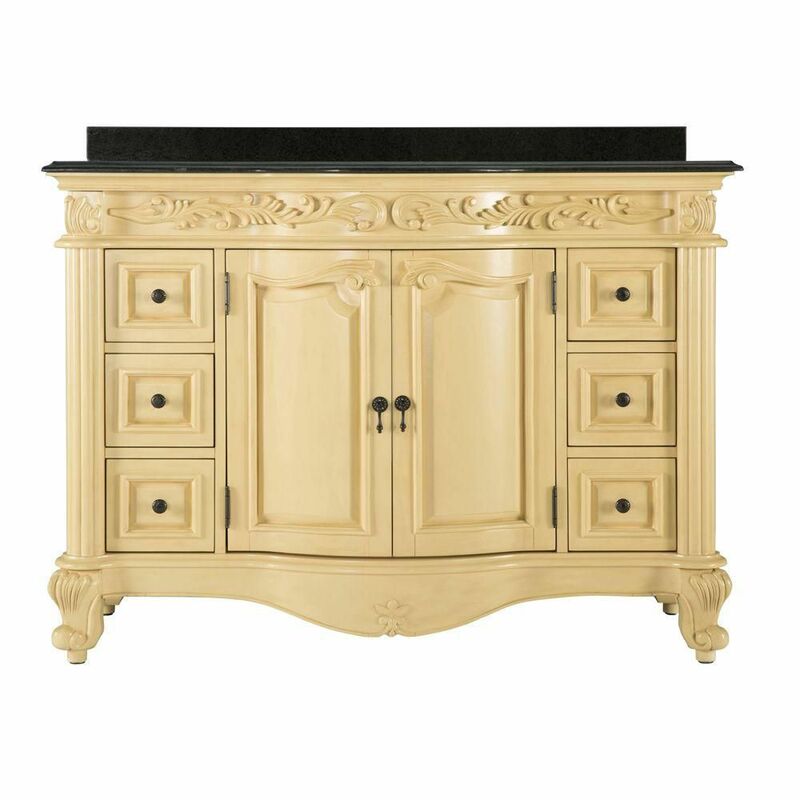 Estates 49-inch Vanity in Antique White with Granite Vanity Top in Black is rated 4.4 out of 5 by 41. Rated 5 out of 5 by Jake from good quality looks great really nothing to complain about once you get past the price tag. pretty happy with it. Rated 1 out of 5 by UpsetCustomer from This came as a light mustard "baby poop" yellow...nothing like the picture!!!!! All the work redo... This came as a light mustard "baby poop" yellow...nothing like the picture!!!!! All the work redoing a large master bath with two cabinets and two mirrors...all have to go back! UGLY!!!!!!!!!!!!!!!!!!!!!!!!!!!!!!!!!!!!!!!! Rated 5 out of 5 by Fran from It is a little more yellow in color and I would not call it antique white. But, it is still a lo... It is a little more yellow in color and I would not call it antique white. But, it is still a lovely vanity. Lots of drawer space on each side as well as a large drawer in center. Some parts were missing but called company and they are sending them out asap. This vanity takes the wide faucet setting ( 8 inch) so be aware of this before you purchase your faucet. It is a very heavy vanity too, so it will take two to move it around for placement. All in all, I am very happy with it and would buy it again. Rated 5 out of 5 by Annieo from Beautiful Details Bought this to replace old one after water damage from over flowing bathtub. It is very heavy, has beautiful French styling and was easy to assemble and install. Only disappointment is it isn't antique white as described but more yellow. Rated 5 out of 5 by GPandDP from Beautiful Vanity This vanity is a beautiful upgrade for my master onsuite! I would call the colour more of a cream than antique white though. It really is quality made though! I would suggest putting in soft close drawers, but otherwise I am very happy with it!